“BALANCING ACT: Weaving Worlds Together Through Art"
Everything in nature is balanced. Life balances death, day balances night and yet we lead inherently unbalanced lives. It is a constant and delicate balancing act between work and play, family and friends. In Africa the balancing act is not just figurative it’s quite literal as well, where women balance baskets, pots and firewood on top of their heads while carrying out daily chores and caring for their families all the while. Your purchase of these remarkable baskets helps provide income for the weavers so that they may better provide for their families. The exhibit weaves worlds and people together through art. 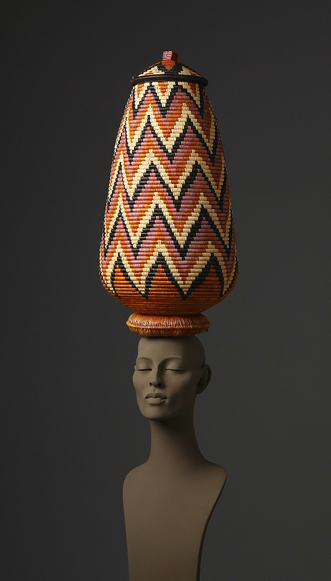 “Balancing Act” features an extraordinary collection of masterfully woven Zulu baskets from Kwa Zulu Natal, South Africa.This not to be missed exhibit is now on view from at Africa and Beyond, 1250 Prospect Street (2nd level), La Jolla, California 92037. Each basket is made by hand using indigenous raw materials such as palm fronds, grasses and is dyed with natural materials such as bark, berries, roots, etc. Each basket is unique in shape, size and design. The colorful patterns tell detailed stories making each basket a woven wonder. The Zulus are renowned for their basket weaving skills which are passed down from generation to generation. In recent years a new art form has emerged using brightly colored telephone cable wire woven into fanciful baskets. Historically, baskets were made for utilitarian purposes to store grains, herbs and home brewed beer for everyday as well as ceremonial use. Beer is a major part of social traditions. It is a symbol of hospitality and also serves as offerings to the ancestral spirits. Today, these baskets are highly sought after by collectors world-wide.